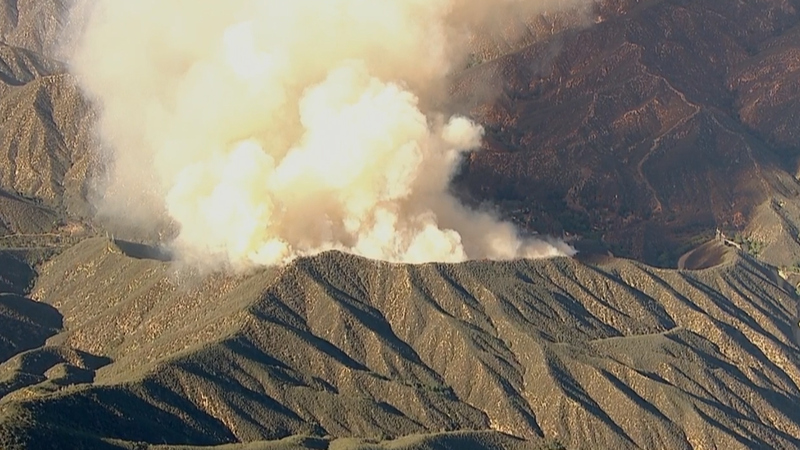 CASTAIC, Calif. -- Los Angeles County firefighters are battling a 500-acre brush fire that burned three structures and damaged three others in the Angeles National Forest in Castaic Sunday afternoon. The fire is 0 percent contained. The blaze, dubbed the Warm Fire, was reported to be near Lake Hughes and Warm Springs roads. About 75 percent of the structures at Warm Springs Rehabilitation Facility were burned. Two men were detained for questioning in connection to the fire shortly before 9 p.m. Firefighters believe the fire, which is moving rapidly through dry brush, has the potential to grow to 2,000 acres. Fire personnel are dealing with triple digit temperatures, steep terrain and heavy, dry vegetation that can add extra fuel to the blaze. Robert Garcia, fire chief with the Angeles National Forest Service, said the fire started in the area of the rehabilitation facility and quickly grew. Edison crews are also at the scene as the blaze threatens nearby power lines. No evacuations have been ordered. Lake Hughes Road at Elizabeth Lake Road was shut down.